So did Barb. She had her mother-in-law’s wedding ring, a pair of small diamond stud earrings given to her early in her marriage, a couple of rings from her own mother and other odds and ends. They weren’t her style anymore, but she didn’t want to just sell them. And she also had a big anniversary coming up and wanted something extra special. Barb made an appointment with Scott and brought in her bag o’gold. After sorting and evaluating the old jewelry, Scott talked to her about what kind of custom designed jewelry she wanted to create. Like many of us, Barb didn’t want or need any more super dressy pieces. Her lifestyle is much more casual. But she wanted a custom pendant that could serve double duty. While talking with Scott, he discovered that Barb and Paul have three children and were going to be married 40 years (wow!) So he custom designed the pendant to tell some of that story as well. The three larger diamonds represented each of their children, the four circles (counting the circle at the top of the pendant where the chain runs through) were for each decade they’ve been married. And the smaller diamonds that speckled the circles came from her own mom, and her mother-in-law, and from jewelry that she collected during her travels with her husband. 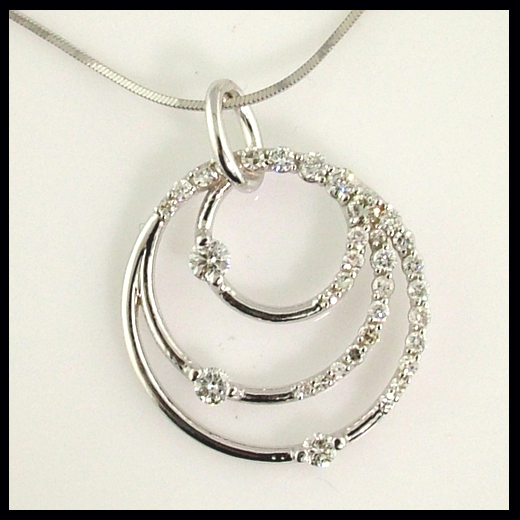 So not only did she recycle her diamonds, but she also traded in the old gold mountings that held them, making this custom diamond pendant very affordable! Best of all, just by switching out the chain, Barb can change the look to dressy (hanging the custom pendant on an omega chain), professional (using any one of her many 14k white or even yellow gold chains) or casual (stringing it through a black cord). Judging from the huge smile from Barb when she saw the finished piece, it looks like all her goals were made. Designing custom jewelry should be this easy!